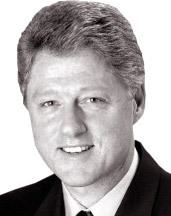 San Francisco, CA (USA) -- According to thebuddhism.net news site, in an article dated January 10, 2013, former US President Bill Clinton has hired his own personal Buddhist monk to teach him how to properly meditate. Bill is learning to meditate and has reportedly turned to a vegan diet as well. All this change has apparently been influenced by his recent heart scare where in February 2004 when he was rushed to Columbia Presbyterian Hospital in New York City because he started experiencing some awful chest pains. At that time, he had to have two coronary stints put into his heart and a few months later, in September, he had to undergo quadruple bypass heart surgery. In 2010 he then had a clogged artery that the surgeons had to reopen which was his second heart operation in five years. He says that learning meditation helps him to relax, which apparently stress is supposedly one of the biggest contributors to this heart condition. He travels a lot and his job is highly stressful, learning to meditate he learns to relax and says he is doing much better after his two life changing decisions. He reportedly also has a favourite mantra that he loves to chant when things get hectic and says that is really does help him to relax and think more clearer. He used to eat a lot of fast food apparently according to the news reports, but now he has decided to give up all that and replace it with a lot of fruits and vegetables with the occasional fish! Outstanding I say, we need more government officials turning to healthy ways of life and Buddhist meditations to relax and maybe our country would start looking up. As 2010 and 2011 taught us, Buddhist meditation and healthier diets are starting to make a trend with everyone. More and more people are seeing the benefits that come from a life of relaxing meditation and eating healthier and changing their lives. From Tiger Woods to Steve Jobs (RIP) Buddhism is beginning to be seen in some very high places. It is true meditation has a lifetime of relaxation and peace as well as health with it. Everyone could benefit from the changes that Clinton has made, and good for him.